The Micro-Generation Awards span the micro-generation of sustainable energy across the UK. True sustainability is achieved when everyone, everywhere, can meet their basic needs forever and micro-generation serves a crucial role in providing sustainable energy at a local level. Sustainable energy sources are the best sources of energy for homes and businesses, because they are not only renewable but are also frequently developed through micro-generation closer to the end-user than traditional power plants can ever be. 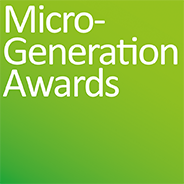 The Micro-Generation Awards have been two years in preparation. Even so, we know that in their inaugural year, there may be omissions. We are happy to accept constructive criticism that will enable us to make the Awards even more representative of this vibrant sector in their second year. For instance, you may spot a gap in the categories. If so, please let us know how we might fill the gap. The Category list is not overburdened with wordy criteria. We believe in not being too prescriptive, preferring you to tell your story in your own way for the judges. All we ask is that you use the basic template of headings (found on the Useful Advice page) to guide the preparation of your submission document. This helps the judges when comparing entries and it helps the marking system by allowing allocations of marks to each sector of a submission to be used consistently. We look forward to receiving your entries for the 2020 Awards and wish you well with your submissions. September: Awards lunch and ceremony, London (details to be advised).